Al Golden’s squad, now a year older and a year more mature, looks to improve upon its four win season of 2007.
was a grueling and educational training camp. In just two years work, Al Golden has instilled a winning mentality in his players, and it has yielded confidence and change. Derenthal has suffered through some painful seasons, but is finally getting respect. He was recently nominated for the Rimington Trophy, an award given to the nation’s top snapper. 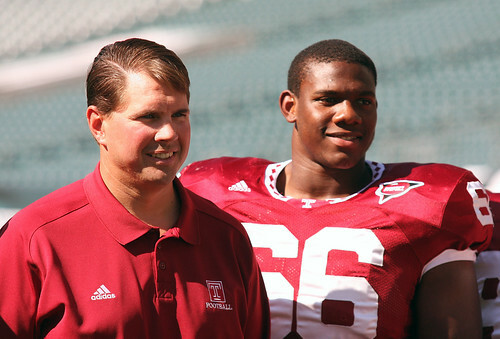 Another source of leadership stems from senior wide receiver Bruce Francis, whose breakout 2007 campaign provided six touchdowns, and gave the Owls a legitimate deep threat. A core group of players on both sides of the ball, coupled with the fact that the Owls only lost one starter from a year ago, could lead to improvement from 2007’s 4-8 record. Friday’s opener pits Temple against Army, a team that was only 3-8 last year, but thrashed the Cherry and White 37-21 at West Point on Sept. 29. Another variable working against the Owls will be their poor history in road games, including a 1-5 mark last season. The loss to the Black Knights was just one of five to start the season, as winning early games has eluded the Owls over the years. This season they are poised for a quick start, but like usual, are only concerned with the task at hand. Following that same formula is junior defensive tackle Andre Neblett, who returns as a key component in the Owls solid defensive front. He admits that a major fault on the field was working together as one cohesive unit. This season Neblett’s interior presence, combined with the strength and talent of senior defensive ends Junior Galette and Leyon Azubuike, will allow the Owls to stop more plays in the backfield. Offensively the Owls eagerly welcome senior quarterback Adam DiMichele back into the fold, after he fractured his left tibia against Miami (OH) on Oct. 20. The athletic signal caller sparked the offense with his arm and legs, throwing for 12 touchdowns and running for two more before his season was cut short. The Owls will take on a challenging bevy of Mid-American Conference opponents, including Central Michigan, a team that went 6-1 in conference play last year. side,” said Golden. “We’re playing Central [Michigan] away and were playing Western [Michigan] at home, two teams we haven’t beaten. The crossover games are going to be equally as demanding as the East division games,” he concluded. The optimism is back for the Owls, but the team has a long road ahead. If all goes as planned, the sacrifices made in August will translate into a potential December celebration.